This breed was originally developed by 19th century gamekeepers to guard estates, and although other crosses were tried, the winning combination was that of the Mastiff/Bulldog cross. This was because the Bulldog that is a brave and very tenacious dog, simply did not have the size needed to knock over a poacher, and hold him down until the game keeper. Plus, they tended to be aggressive to the poacher, rather than just hold him down . The Mastiff on the other hand, hand the size, but was far too laid back. In 1924 the breed was recognized as a purebred dog by the English Kennel Club, and was recognized by the American Kennel Club in 1933. Although bred to be a guarding and protection dog, the Bullmastiff today is better known for its loyalty and total devotion to its family. This breed may act as if it is a Maltese with its family, however this attitude can change very quickly when a stranger comes to the home - on average this breed is suspicious with most strangers. Do to this, it is vital that this breed receives early socialization by way of puppy school and that the socialization is ongoing. His innate behaviour often comes to the fore of being independent, which really can make training a bit of a challange. This breed it is best to have several training sessions of very short duration rather than one long one working with praise and food rewards. Also remember that you have multiple hours of your day with your dog, so in addition to loving it, and having fun, turn these into training sessions as well. If you don't like dogs that slobber, drool and tend to snore, then this is not the breed for you! Although very loyal to its family, this dog needs to know its place in the human/canine social structure, so it is up to you to put down the basic House Rules and be consistent about them. However, if you are a couch potato, this breed will suit you down to the ground. Despite it's large size, it does not require heavy exercise, and surprisingly enough, this makes the breed great for apartments and town houses - although you may have a problem convincing the Body Corporate about this! Additionally, this breed is not always tolerant of other dogs and because its family is the most important thing in it's life, resource guarding its people towards another dog can easily happen. With early socialization they can learn to get on with other dogs outside the home, but having two of them in the home is not a good idea and is not recommended, even if not the same breed - they can be aggressive. 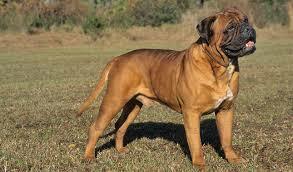 These are working breeds, and especially mature males do not get on with any other males at all, regardless of size. If introducing them to any other dogs, it must always be on lead and knowing that you can handle the dog if it lunges. These dogs are not recommended for home with other animals. The majority of this breed are good and very patient with children if introduced to them as a pup and they grow up with them. However as much socialization with babies, toddlers and young children, as possible must be done while a pup. What one has to bear in mind, is that this is a guard dog and will protect those it loves and if it fears its own family child is in danger it can react. This can happen while kids are running around, rough tumbling, playing etc, if the dog feels the child is in danger. Children and dogs should always be supervised, especially in a situation as described above. The major health concerns of this breed include hip and elbow dysplasia. Gastric torsion and bloat. With any dog that is prone to bloat, feed 2 - 3 smaller meals throughout the day - do not exercise for about an hour before feeding, and no exercise 1 - 2 hours after eating. Limit them drinking copious amounts of water at once. Other health issues nclude entropion, cancer (hemangiosarcoma, osteosarcoma, lymphosarcoma, and mast cell tumors). Don't keep this breed with other small animals.